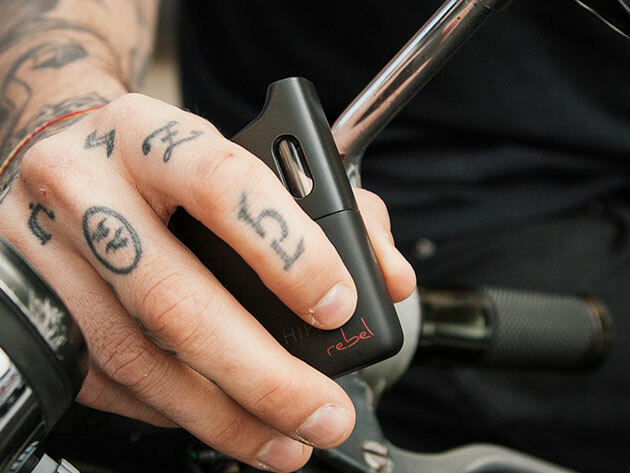 The Rebel is the newest offering from the popular vaporizer brand Hippie, and, contrary to the Attorney General's belief, smoking dry herb with it does not necessarily preclude you from being a good person. Rather, the Rebel will make you feel like a very good, smart person. The new design offers two immediate advantages over its predecessors: there is no protruding glass mouthpiece to accidentally break, and the palm-fit is more discreet than a long, protruding tube. Which, who knows, may become especially useful soon enough. With the added surface area, this vape hosts accessible controls to precisely dial in your preferred temperature. Its rounded form makes it easy to clean, and affords plenty of room for a standard micro-USB charge port. But most importantly, it allows the convection heating element to sit underneath the herb chamber for a more efficient, smoother airflow. The Rebel’s lithium ion battery lasts up to 8 use cycles per charge, and it shuts itself off automatically after four minutes in case you forget. You can get the Hippie Rebel Vaporizer in the Boing Boing Store for just $109.